Executive Chairman of Nigeria's Economic and Financial Crimes Commission (EFCC), a commission tasked with the duty of countering corruption and fraud. Nuhu Ribadu got admission to study law at Ahmadu Bello University Zaria, Kaduna State from 1980 until 1983, following which he received a Bachelor of Laws degree (LL.B). He proceeded to the Nigerian Law School the following year and was called to Nigerian Bar in 1984. He immediately did his Master of Laws degree at Ahmadu Bello University Zaria. He is a TED Fellow and a Senior Fellow in St. Antony's College, University of Oxford, UK. In the year 2003, Ribadu was appointed the Chairman of the Economic and Financial Crimes Commission by the then Nigerian president, Olusegun Obasanjo. In the year 2007, his appointment was renewed and he was consequently promoted to the position of Assistant Inspector General of Police. In December 2007 Mike Okiro, the then Inspector-General of Police, stated that Ribadu would be removed as EFCC chairman for a one-year training course. Under Ribadu’s administration as the EFCC Chairman, the Commission charged prominent bankers, commissioners of Police, former as well as serving State governors, ministers, Senate presidents, high-ranking political party members, and perpetrators of advance fee fraud to court. The Commission also issued thousands of indictments and secured over 250 convictions. The most notable among the cases was that of the former Inspector General of Police, Tafa Balogun, who incidentally was Ribadu’s boss. The Police boss who was convicted, jailed and made to return £150 million under a plea bargain. It was under Ribadu's administration as the EFCC that the following feats were achieved: admission into the prestigious Egmont Group; the de-listing of Nigeria from the FATF List of Non-Cooperative Countries & Territories, and the withdrawal of the US Treasury FINCEN Advisory on Nigeria. It was evidence produced by Nuhu Ribadu that helped prosecute foreign businesses who offered bribes while doing business in Nigeria. 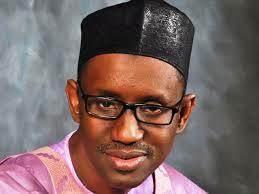 Nuhu Ribadu has consistently being an inspiration to the youths to become the agents of change. On 15 April 2008, Nuhu Ribadu was given the World Bank's 2008 Jit Gill Memorial Award for Outstanding Public Service, for leading a courageous anti-corruption drive in Nigeria, as Head of the Economic and Financial Crimes Commission (EFCC). Nuhu Ribadu lived in exile until the year 2010 when he returned to Nigeria and declared his intention to contest for the position of the President of Nigeria under the platform of the Action Congress of Nigeria (ACN). On Friday, January 14, 2011, Nuhu Ribadu was adopted as the presidential candidate of the ACN though he was not later successful at the election. In August 2014, Mallam Nuhu Ribadu defected to the ruling Peoples Democratic Party (PDP) with the intention to run for the Governorship of Adamawa State, North East Nigeria. He actually contested the election but lost.